The really good stuff. 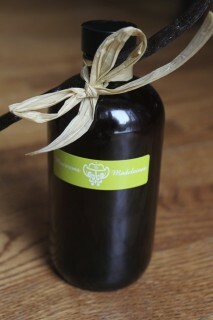 Vanilla extract from Stephan Ethier of Macarons et Madeleines. I bought a pretty bottle of liquid vanilla when I was in the French patisserie Macarons et Madeleines, looking for a pick-me-up pain aux raisins for elevenses. (See Anne’s Pick of May 31, 2012). And then – zut alors! – as I am homeward bound with my treasures in my car the bottle rolled off the passenger seat, smashing onto a ceramic tile sample I had left on the car floor in wait for its return to Home Depot. The vanilla lid broke, the extract began oozing out and, as I pulled over to rescue it, I got a ticket for pausing in a bus lane during OC Transpo-only hours. No amount of truth telling convinced the officer. Though I am convinced she did look longingly at my pain aux raisins before commenting on the smell, which was quite boozy. 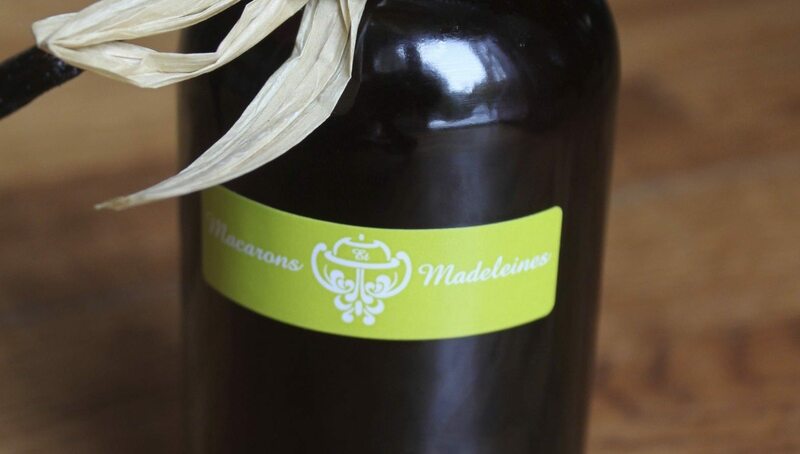 For the purposes of the photograph, I have tucked the vanilla bean back under the raffia and turned the bottle so you cannot see the cracked lid. Nor can you see – I hope – that a third of the liquid is gone. The stain remains, reminding me of just how much I paid for that extract, but also – and more importantly — of my mum’s freshly baked vanilla cream cookies, of childhood milkshakes, of my nana’s vanilla pudding, of creme brulée from Cafe Henry Burger. These memories waft up from the carpet and they make me smile. The aroma is still strong. It’s even overwhelmed scent of hockey bags, basketball shoes, and wet dog. I conducted my own little test. I prepared two cups of warm milk. Into one I poured a teaspoon of a supermarket brand of pure vanilla (ClubHouse), and in the other, the vanilla from Macarons et Madeleines, aged eight months, made with beans from the Madagascar region infused in vodka. No contest. Just like those pain aux raisins maitre-patissier Stephan Ethier crafts — with his vanilla of superior product — this stuff rocked. Spill some today. Macarons et Madeleines, 46 Lorne Ave., 613-422-6215.